If you just hooked up your new Roku digital video player, you've probably already watched a few videos from the channels that were preloaded on your device. After that, you may have gone into the Channel Store looking for more channels. 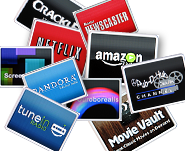 And now you may be feeling overwhelmed when faced with over 400 channels of content. If you're wondering where to start, don't worry, RokuGuide is here to help. Shown below is my list of Essential Roku Channels for all new Roku users. First, a disclaimer: Everyone will have their own idea of which channels are essential. If you're a heavy metal fan, you may consider one or more of Roku's heavy metal channels to be essential. I've tried to list channels that have enough variety of content that they will appeal to a wide cross-section of Roku users. On the other hand, one of the largest channel categories is Religion & Spirituality, but the selection of those channels is a personal matter, and I can't tell you which, if any, religious channels are essential to you. So, here is my humble attempt to steer new Roku users to content that I think many of you will find entertaining, informational, or useful. I expect a lot of disagreement, and I'd like to hear which channels are essential to you. Just leave your own list of essential channels in the comments section below. Netflix - Yes, Netflix. Despite a mass exodus of customers following price increases, splitting (then not splitting) the DVD and streaming services, and other gaffes, Netflix is still the granddaddy of streaming movies on Roku. And at $7.99 per month for unlimited streaming movies and TV shows, it's still a great value. Amazon Instant Video - If you don't want to commit to a recurring charge for a Netflix subscription, Amazon provides pay-per-view access to over 100,000 movies and TV episodes. These videos can be purchased or rented. This is great for those who don't need an all-you-can-eat plan, and want to pay as they go without incurring a monthly fee. But wait, Amazon offers both. The Prime Instant Videos service, at $79 per year, is also a great value for unlimited access to over 10,000 movies and TV episodes. You'll still have to rent or buy the movies that aren't part of the Prime program, but you also get free 2-day shipping from Amazon - which was the original intent of the Amazon Prime program. Pandora - Free music, customized for your personal tastes. If you already have a Pandora account, link it to your Roku and your channels will all be available on the Roku. The Roku channel's options are more limited than on your Web browser and some other devices, and you don't have access to detailed album and artist information, but you can still like, dislike, and skip. And that's fine, because if you're streaming Pandora through your sound system via your Roku, you aren't likely to be parked in front of the TV to interact anyway. TuneIn Radio - As much as I like Pandora, there are times when I want to listen to music selected by a human. Other times, I just want to listen to a real radio station with real DJs. For those times, I turn to TuneIn Radio. TuneIn Radio gives you access to over 50,000 free AM/FM and Internet radio stations. iTunes Podcasts - This private channel provides access to iTunes' massive library of video and audio podcasts. Whatever your interests or obsessions, you're sure to find somebody, somewhere, podcasting about it. This is a great channel for exploration. Nowhere TV - Also a private channel, Nowhere TV provides many of the same podcasts you'll find on iTunes Podcasts, but the selection is curated by Nowhereman, who sorts through the many available podcast series and offers only the cream of the crop. I actually recommend starting with Nowhere TV, and moving on to iTunes Podcasts if you haven't found anything of interest. Weather4us - Hands down, the best weather app available. Weather Underground serves up a nice weather channel, but Weather4us takes it a step further and then some. I use this app daily. And it includes a nice screensaver (see next recommendation below). [Fill-in-the-blank] Screensaver - I won't name any particular screensaver as an essential because there are several good ones, but ditch the default Roku logo. No offense to Roku, but the add-on screensavers are much better. My favorite was CLOC, which displays time and current local weather in LED-style, until I installed Weather4us. Weather4us provides an awesome screensaver that cycles through the weather forecast, national weather maps, and solar and lunar photos. But there are other great screensavers like Screenshades and Ouroborealis that are more artistic and aesthetically-pleasing. Pub-D-Hub or Movie Vault - Now I'm venturing into an area that is less likely to be of widespread interest, but if you're a fan of the cable channels TCM Turner Classic Movies and AMC, then you should love these two Roku channels. Crackle - If you're looking for free, relatively recent movies and TV shows, then you'll want to check out Crackle. You won't find nearly as large a selection as you will on Netflix or Amazon, but there's plenty to like here - especially for the price. Flickr - If you've never seen your photos blown up to television-size, then you're in for a treat if you upload them to Flickr.com and view them through the Flickr Roku channel. There are other photo sharing and viewing channels like SmugMug and, most-recently, Shutterfly, but Flickr is the king of online photo sharing. With Flickr, you will also have access to a huge library of stunning photos from other Flickr users. I feel like I barely broke ground in recommending channels for new Roku users, so look for a follow-up to this article in which I'll give you a list of additional channels for consideration. I also realized that I haven't posted reviews of some of these recommended channels. I'll be doing that in the next few days, so check back for more information. And as noted above, I would love to see your list of essential channels, so please post them in the comments section below!